The Battle with Zeniff by James Fullmer. Only five years into the reign of the judges, the pressure to reestablish a king was already mounting. A “certain man, being called Amlici,” emerged, and he drew “away much people after him” who “began to endeavor to establish Amlici to be a king over the people” (Alma 2:1–2). When “the voice of people” failed to grant kingship to Amlici,1 his followers anointed him king anyway, and they broke away from the Nephites, becoming Amlicites (Alma 2:7–11). However, during the account of Aaron’s missionary journey among the Lamanites, he teaches a group of people called “Amalekites,” who are mentioned with no introduction or explanation as to their origins (Alma 21:2–4, 16).3 Later they are included in a list of Nephite dissenters (Alma 43:13), but this is all that is said of their origins. Royal Skousen has found evidence from the original and printer’s manuscripts that strengthens this suggestion.6 In the printer’s manuscript (Alma 2 has not survived in the original manuscript), the first occurrences of Amlicites are spelled Amlikites, indicating that both Amlici and Amlicites were originally pronounced with a hard c, rather than the soft c Latter-day Saints have come to use. If the Amalekites and the Amlicites are indeed the same group, then two mysteries in the Book of Mormon are resolved: (1) what happened to the Amlicites, and (2) who are the Amalekites. It would seem that, rather than completely disappearing after the death of their leader (Alma 2:31), the Amlicites continued as a distinct sub-group among the Lamanites. Cooperating with Lamanites and Amulonites, they had built a city (Alma 21:2). They also “built synagogues after the order of the Nehors” (Alma 21:4), thereby continuing to perpetuate the same ideology as Amlici, who himself is introduced as being “after the order” of Nehor (Alma 2:1). While these people all professed belief in God, they rejected Christ. They came to believe in the corrupt doctrine that without any kind of atonement, “God will save all men” (Alma 21:6–8). 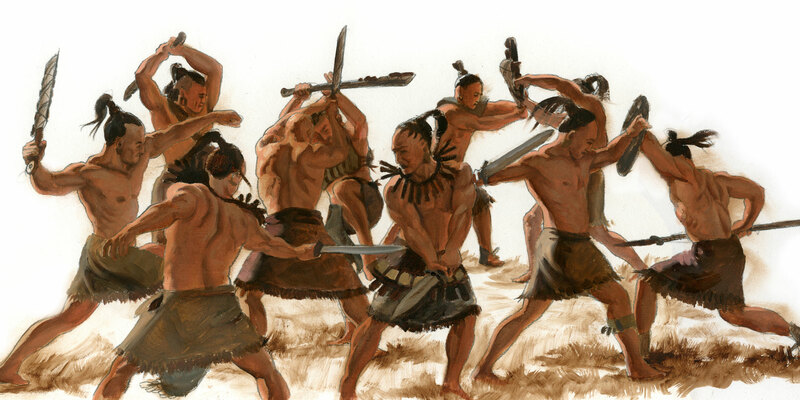 They would participate in the major Lamanite-Nephite wars, many serving as military commanders due to their passionate hatred toward the Nephites (Alma 43:6–7, 20). It also clarifies the ambiguous chronology of the sons of Mosiah’s mission, which started in the first year of the reign of the judges (Alma 17:6) and lasted for 14 years but has very few details or chronological markers. Since the Amlicites/Amalekites were founded in the fifth year of the reign of the judges (Alma 2:1), the events in Alma 21 likely take place at least a year or more later. Told as one story, rather than two, the Amlicites/Amalekites become a more complete case study in the long-term effects of apostasy, right alongside the Zoramites and the Amulonites. Royal Skousen, Analysis of Textual Variants of the Book of Mormon: Part Three, Mosiah 17–Alma 20 (Provo, UT: FARMS, 2006), 1605–1609. J. Christopher Conkling, “Alma’s Enemies: The Case of the Lamanites, Amlicites, and Mysterious Amalekites,” Journal of Book of Mormon Studies 14, no. 1 (2005): 108–117, 130–132. John A. Tvedtnes, The Most Correct Book: Insights from a Book of Mormon Scholar (Springville, UT: Horizon, 2003), 292–293. 1. On the “voice of the people,” see Book of Mormon Central, “How Were Judges Elected in the Book of Mormon? (Mosiah 29:39),” KnoWhy #107 (May 25, 2016). 2. See Paul Y. Hoskisson, “Amlicites,” in Book of Mormon Reference Companion, ed. Dennis L. Largey (Salt Lake City, UT: Deseret Book, 2003), 47. 3. For a brief summary of the Amalekites, see Craig K. Manscill, “Amalekites,” in Book of Mormon Reference Companion, 44–45. 4. See John A. Tvedtnes, The Most Correct Book: Insights from a Book of Mormon Scholar (Springville, UT: Horizon, 2003), 292–293; J. Christopher Conkling, “Alma’s Enemies: The Case of the Lamanites, Amlicites, and Mysterious Amalekites,” Journal of Book of Mormon Studies 14, no. 1 (2005): 108–117, 130–132. 5. Conkling, “Alma’s Enemies,” 111. 6. Royal Skousen, Analysis of Textual Variants of the Book of Mormon: Part Three, Mosiah 17–Alma 20 (Provo, UT: FARMS, 2006), 1605–1609. 7. Skousen, Analysis of Textual Variants, 1607. 8. Skousen, Analysis of Textual Variants, 1606. 9. Conkling, “Alma’s Enemies,” 110–111, quote from 111. 10. Conkling, “Alma’s Enemies,” 113.